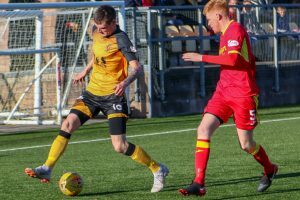 Annan Athletic got their league campaign back up and running following the previous weeks disappointing defeat at the hand of Peterhead with a victory over struggling Albion Rovers at Galabank. Annan always looked on top of this fixture but there were spells in the match where Annan did ride their luck and on another day they may not have been as fortunate. The match was played in glorious sunshine with not a breath in the air and Annan boss Peter Murphy elected to go with the same starting line up as the previous week . Annan started the match very positively and they had a goal chalked off for offside in the 13th minute after Tommy Muir’s shot came off the post and Tony Wallace headed the ball into the net from close range only for the goal to be chalked off. Annan continued to turn the screw on the Albion Rovers defence and in the 26th minute Albion conceded a needless penalty when Brian Wharton fouled Tommy Muir and Tony Wallace converted the spot kick to give Annan an early incentive. Chris Johnston was a constant threat all afternoon and minutes later he set up Tony Wallace who blasted over the bar as Annan looked to increase their lead. Albion gradually got a foot in the game when Jonny Jamieson denied Albion Rovers when he pulled off a fine save at full stretch to turn Jamie Watson’s netbound shot round the post for a corner in the 31st minute. Albion Rovers were enjoying their best spell in the game and minutes later Watson’s 35th minute looping header went narrowly past the upright. Annan were very fortunate in the 40th minute when Watson’s effort came off the post and into the arms of Jamieson. Annan had enjoyed a period of good fortune after a promising opening 30 minute spell and Albion Rovers certainly displayed enough to leave you wondering how they are struggling down at the bottom of the table. Annan started the second half very much on the front foot and it was Chris Johnston who won the ball wide on the bye line to pick out Scott Roberts who slotted the ball into the net from close range to give Annan a two goal advantage in the 55th minute. Albion Rovers responded 5 minutes later when they were awarded a free kick 25 yards out and Lewis Mclear’s low effort beat Jonny Jamieson and the Annan defensive wall to bring the Rovers back into the game. John Cunningham an ex Annan player was introduced at the expense of Jamie Gallagher in the 55th minute and in the 65th minute Albion made another change when Ryan Watters was replaced by Ronan Kearney and Annan took off Kyle Bradley who was replaced by Ayrton Sonkur in the 65th minute. Annan started to dictate the game and David Wilson has a great effort headed off the goal line before Scott Roberts had a goal chalked off. Annan were causing Albion Rovers all sorts of problems particularly down the right through Tommy Muir and Chris Johnston and it came as no real surprise when Muir created the opening for Scott Roberts to slot home from 6 yards to give Annan a 3-1 lead. Muir who was outstanding then set up Wilson but his effort went narrowly over the bar. John Cunningham finished a promising Albion move which Jamieson turned round the post. Overall it was a decent team performance from Annan ahead of their Scottish Cup tie against Rothes on the 20th October and the victory and points tally at the end of the first quarter fixtures keeps Annan in contention at the top half of the table. Annan Athletic – John Jamieson , Scott Hooper, James Creaney ( Lewis Strapp 76 min), David Wilson, Owen Moxon, Kyle Bradley (Ayrton Sonkur 65 min), Chris Johnston, Ryan Sinnamon, Scott Roberts, Tommy Muir, Tony Wallace ( Max Wright 84 min) . Subs not used Ross Ferguson, Aidan Smith, Ruaridh Langan, Steven Swinglehurst. In the other SPFL2 matches Edinburgh City maintained their impressive form at the top of the league with a convincing 3-0 victory over Berwick Rangers this was after manager James McDonnah and player Conrad Ballatoni lifted the manager of the month and player of the month awards. Peterhead maintained their impressive form with a convincing 3-0 victory over near neighbours Elgin City. Queens Park lifted all the points against Clyde courtesy of a Josh Peters 28th minute strike. Cowdenbeath lifted the points courtesy of a 6th minute strike from David Marsh but they had to see the match out with 10 men after Gary Fraser was sent off in the 28th minute.